Installation or replacement of cistern takes place in two cases, when the construction is built and repaired before completion, and also when there is gut renovation which includes the renovation of bathroom. The renovation can include only replacement of old leaky cistern or changing for modern equipment. The replacement is needed when there are shear ruptures, splits and other types of mechanic damage failures. In this case immediate replacement is required. If you’ve decided to change not the whole kit, but only the cistern, it saves your family finances. It allows you to modernize your place with minimum expense, because you don’t have to dismantle a toilet bowl and to install a new one. But it can be done if the design of the toilet bowl allows doing it. But you don’t have to choose and to install a water closet supply tank by yourself, because it can bring on some problems and cause deadlock for a person if plumbing is not his strong point. 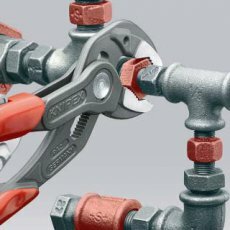 A professional plumber can help you to solve this problem. 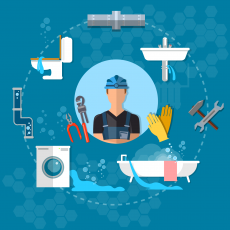 The professional plumber will provide effective assistance in choosing proper plumbing equipment, to choose such type of cistern which will change the interior of your bathroom. Replacement of the cistern should be carried out according all necessary steps. He has to turn the water off at the mainline. Then he has to dismantle the old plumbing equipment and after it to start installing new equipment. 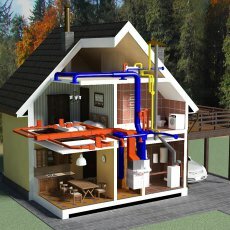 The cistern must be installed, valves equipment must be adjusted, and then cold water supply must be connected up. After all there has to be a check test in order to make sure of proper installation of cistern and air tightness of the pipeline joints. While erection, even small inaccuracies may lead to leaking at its best. However, it can lead to dire consequences. You may flood your neighbors in apartments building. So you will have heavy expenses in order to renovate not only your place but the place of your neighbors also. Such cheerless prospect should be excluded, and you should ask for help a professional plumber. 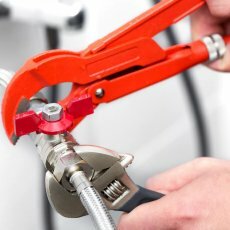 Only an experienced plumber knows all peculiarities of plumbing service and will take into account all details of cistern installation or replacement. 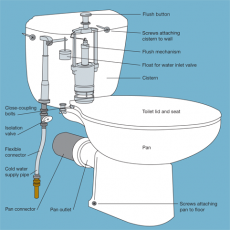 The cistern should perform the functions of drain equipment, maintaining the hygiene of the toilet. The main indicator of the quality of the cistern is its silent operation. Noise while filling with water, other strange sounds can give evidence of the malfunction of the cistern or of the wrong installation. 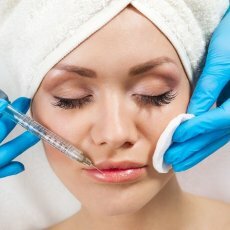 Disrepair sometimes occurs after a long operation because of the consumption. As already said, problems can be caused by incorrect installation and sometimes by production defects. The water connection for the cistern can be made in two ways: from the lateral side or bottom, from right and also from left. Professionals advise to buy cisterns with the bottom supply. These types of cisterns are characterized by the most silent fill with water. But both models are supplied with a special plastic plugs that are inserted into unused hales for supplying water. 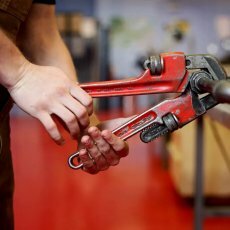 But if you have some experience and a wrench you can always change the place of supply. It is necessary if you want to move the riser of cold water. Plumbing ware of most cisterns are made from a special type of plastic and supplied with a diaphragm float valve. This is done in order to avoid the corrosion and rust of equipment. But the work-piece is not very long lived. 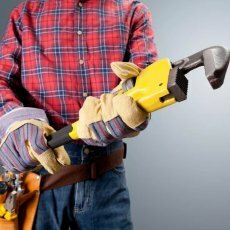 If there is damage you have to replace the whole installation, which will cost the bundle. Membrane valve is designed for operation in pure water. Unfortunately, the water that is in our hydraulic pipe is not clear. There is rust and sand in the water, which can make the equipment inoperative. Sometimes there can be water overtopping because of dysfunction of cistern. Usually professional plumber can advise you to install coarse-mesh filter before installing plumbing equipment. Also he may advise you to get cistern with metal plumbing ware, because it’s the best alternative. Also the plumbing ware should have a floating ball. This ball is cheaper than plastic counterpart. Modern cistern plumbing wares are of two types. You can choose single-button system, which has Stop function of water drain till the repeated push of the button. But some people prefer double-button equipment, which can perform full water drain or low-current water drain. They drained the water in the full version of the volume, can also make economical drain. So you can save significantly on utility prices. But to really fix the design, and not to break her completely, you need to gain considerable experience in dealing with such equipment. And also you can save your money paying for utility services. 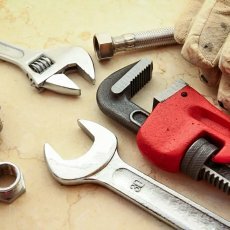 In order to repair the equipment but not to break it completely, you must have an experience in working with plumbing equipment. Tank body can be made of various work materials. But plastic material and ceramic are the most popular. The ways of installation are also different. There are high-up, low-set and joint cisterns. High-up cisterns is joined together with the toilet-bowl by quite long flushing pipe. Low-set of cistern joins the bend with the toilet-bowl. 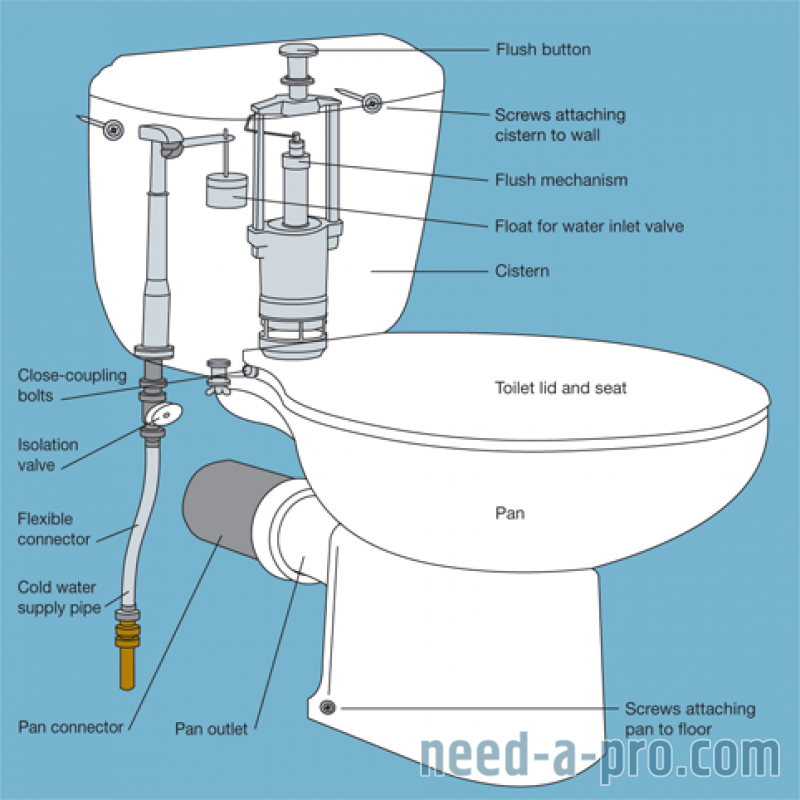 The cistern is installed on a special panel of the toilet-bowl and tightened with the screw bolts. But not long ago progress has offered us different construction of toilet-bowls without flushing cisterns. Its flush hardware is installed directly in the water pipes. It allows you save your money on water charges. But only professional plumber can install such equipment.